Available now on ibooks and Pre-Order for hardcover. 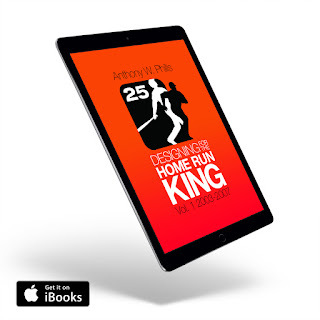 Next Gen Design Book: Anthony Phills Designing For The Home Run King from Anthony Phills on Vimeo. In my career, I have had the chance to work with some of the greatest athletes to ever play professional sports. Athletes like Barry Sanders, Emmitt Smith, Curtis Martin, Wayne Gretzky, Dan Marino and many more! In each case I was part of a team that leveraged their amazing accomplishments on and off the field and distilled it all into cohesive and powerful marketing brands. One athlete though was at the center of a great team, and I will always cherish the chance he gave us all to showcase our talents and be part of something very special in marketing and branding. The team was TEAM BONDS and at its center stood the greatest baseball player that ever lived, Barry Bonds. The team was special for many reasons, including the caliber and diversity of each member, but most of all because in the end it seemed like it was us against the world. I have never worked with an athlete who had a more singular focus when it came to his brand than Barry did. It always came down to the same questions… “What will his fans like the most?” I was the marketing agent and I had to find the right partners, structure the right deals, and ensures the process ran smoothly. Lisa and Rachael worked tirelessly to support that brand and control the public perception of it through the media. And the guy who wrote this book, Anthony Phills was responsible for the graphic side of the brand. The reason I think we are proud to be part of TEAM BONDS is because the work product speaks for itself. Those perfect moment in life where all the right pieces come together under Barry’s vision to create a brand and product experience solely for the fans. No athlete in baseball had ever operated outside the MLBPA Group Licensing agreement before Barry. He pulled himself out of that deal despite blowback from other players and the PA; he knew that was the only way he could deliver the best experience for his fans. He reviewed literally thousands of products and each time he applied that fan litmus test to ensure every single product was right. The extended family of TEAM BONDS was truly amazing and rose to the challenge of creating a revolutionary milestone offering like the one Barry envisioned. Whether it was the genius of Todd McFarlane who went to the ends of the earth to make sure that all the Bonds figurines were perfect, to Majestic that created design after design until we had the perfect mix. Companies like Photo Ball, Topps, The Danbury Mint, Fila, Under Armour, Forever Collectibles, Wilson, Franklin, SAM bats, and many others, all together in this moment to jointly celebrate the march towards the greatest record in sports. This book showcases that amazing team collaboration, and takes you inside one of the most special branding and marketing programs in sports history. I know I speak for the whole team when I say it was truly an honor and we are all grateful to Barry for the chance to help his fans be part of the pinnacle of his historic career. Thanks for putting this together Tony. Once again, by standing behind the guiding mantra of doing what is best for Bonds fans, you have created the cherry on top of the sundae we all have come to know as the chase for the all-time home run record.